The 1939 Register’s importance to genealogy research was increased when the 1931 Census was destroyed in a fire in 1940, and there having been no 1941 census. 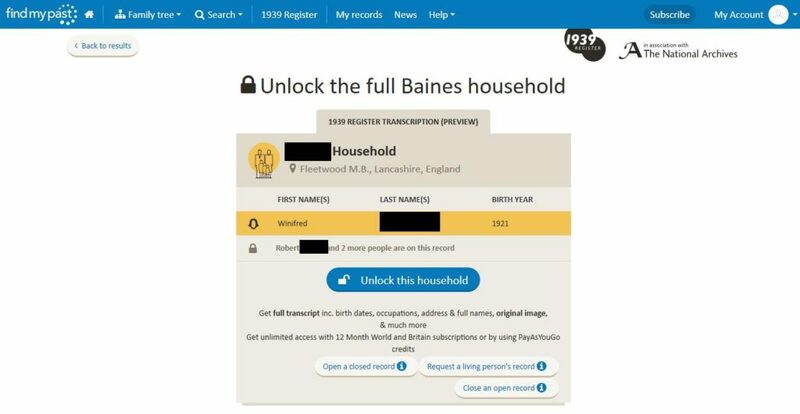 You can search the 1939 Register at Find My Past, viewing records isn’t included in the monthly British subscription plan though, only in the annual one. If you have a monthly subscription, or no subscription, to the site you can either purchase 1939 Register records individually at £6.95 each or in multiples – £24.95 for five households or £54.95 for fifteen households. Whether this is value for money is a personal choice of course and I think depends on how much you need the information. Edit: November 2017 – Access to 1939 Register records is now included in all subscription packages at Find My Past. Records for persons who could still be alive at the moment (generally under 100 years old) are blocked. You can request to have them unblocked by proving that that person is deceased. The first time I searched for my grandmother her sister-in-law’s entry was blocked, when I checked a few weeks later it was viewable so it’s always worth checking back. A more detailed explanation of the 1939 Register, with tips for searching, can be found at Lost Cousins. The 1939 results from Find My Past, you can see this part without purchasing the entry. It’s useful to look at any other names in the household to make sure you have the correct entry before purchasing.